Why Do People Soak Almonds in Water? Almonds are a healthy, savory snack, packed with protein, fiber and omega-3 and -6 fatty acids. Most people are aware of their health benefits and how to incorporate almonds into a healthy diet, but it is less well known that soaking almonds can unlock more health benefits and make them easier to digest. Soaking almonds increases the amount of nutrients and vitamins your body absorbs from the food, making it a simple and effective way to improve this healthy nut. Almonds contain an enzyme inhibitor in their brown skin that protects the nut until the proper levels of sunlight and moisture allow it to germinate. Since the nut does not release its enzymes until those conditions have been reached, eating almonds without removing the inhibitor limits the nutrients your body can absorb and makes the almond difficult to digest. By soaking almonds, you provide the moisture that makes the almond shed its skin and release its enzymes. The process works with most nuts and seeds. Soaking almonds also changes the texture of the nut and makes it easier to chew. As the almond absorbs water, it becomes softer and less stiff. This is of particular benefit to young children and seniors who should avoid hard, difficult-to-chew foods. Softer almonds are easier to digest, which increases the amount of nutrients your body can absorb from the nut. If you use almonds in recipes such as cakes, breads and muffins, softening the nut makes it easier to break into chunks or crush as needed. 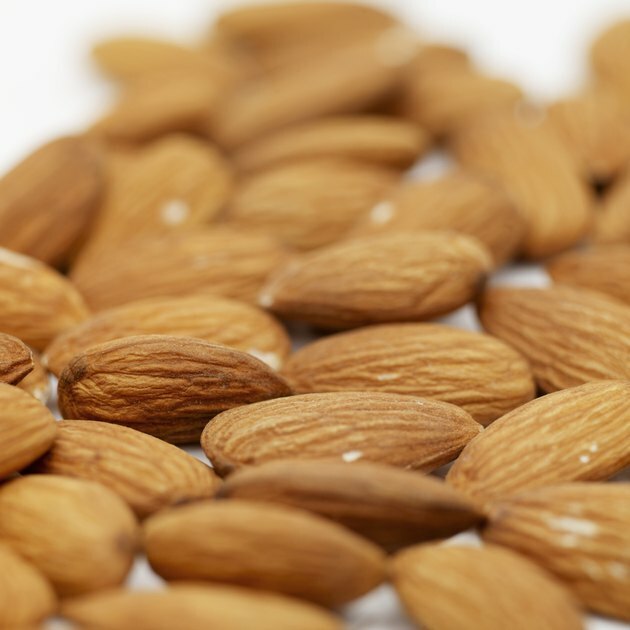 To soak almonds, you need raw almonds, water and a bowl. Purchase raw, organic almonds if possible. Place the almonds in a large bowl and cover them with 2 cups of water per 1/2 cup of almonds. Soak the almonds overnight, then drain and store them in the refrigerator using plastic bags or jars. Almonds will remain fresh for up to a week after soaking with proper storage. The benefits of almonds can be unlocked further by taking soaking to the next level and actually sprouting your nuts. Sprouted almonds are softer, moister and sweeter as well as being easier to digest. Sprouting almonds is also the only way to release lipase, an enzyme which digests fat. To sprout almonds, soak your almonds overnight for 10 to 12 hours, rinse and place them in glass jar with a lid in the refrigerator. It generally takes between one and three days for the almonds to sprout and you can expect a 1/8-inch sprout to grow.